Have you ever wondered what it's like to breathe under water? After a swim around to see the fish and whatever else we can find, it's time to see how you get on in the shallows without assistance (we will be right next to each other though). This course is a sub course of the Open Water Diver course. With this limited certification that takes 2 days to complete you will be able to dive to a maximum of 12m with a PADI professional escorting you. This course consists of some self study, 3 confined water dives and 2 open water dives. If, after completing the Scuba Diver course, you decide to continue to Open Water Diver, this course will be credited towards the Open Water course in terms of number of dives and cost. It takes 3 to 4 days to complete this course and you will be qualified to dive independently with another certified diver to a maximum depth of 18m. This course consist of some self study, 5 confined water dives and 4 open water dives. *NEW* Touch learning for iPad and eLearning are both available for this course - please ask us about it! Continue your education with the Adventures in Diving programme. If you do 3 adventure dives you become an Adventure Diver and with 5 adventure dives, including the deep and navigation dives, you can become an Advanced Open Water diver. The Advanced Open Water Course takes 2 to 3 days to complete and we usually choose from the following adventure dives: Deep, Navigation, Night, Digital Underwater Imaging, Peak Performance Buoyancy, Search and Recovery, Multilevel and more. Boat and Wreck adventure dives can be combined with a 2 dive package on the Zenobia ship wreck*. Read more about the adventure dives here. re you ready for an emergency? Take this one day first aid course and learn how to perform CPR and much more. This course is also a prerequisite for the PADI Rescue Diver course. With this course you will become a very confident diver. During the course you will learn how to deal with potential diving emergencies. You will do some studying and a series of rescue exercises and scenarios. Can be challenging - but also great fun! The Master Scuba Diver is a rating, not a course. It's the highest non professional rating you can achieve. To achieve this rating you need to be an Advanced open water diver, Rescue diver, have 50 logged dives and 5 Specialty ratings. Please talk to us about your specific requirements. Gain more experience in an area that interests you. Teaching scuba diving allows you to share your love of the aquatic world with others while doing what you enjoy. Become a PADI Instructor or Divemaster today. The first step to becoming a Pro is PADI Divemaster. As a Divemaster you can assist the instructor in teaching Open Water students as well as leading dives for certified divers. If you add the DSD (Discover Scuba Diving) leader certification you can also conduct the DSD session designed for people who have never dived before. 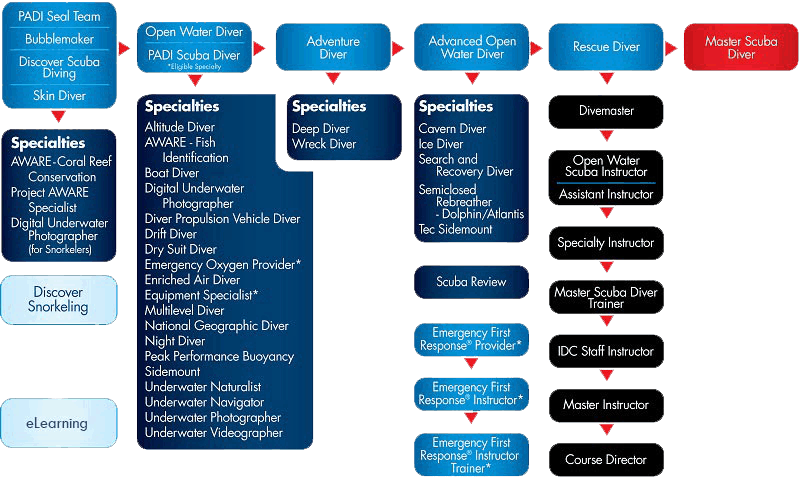 Progression to the next level is OWSI (Open Water Scuba Instructor). At this level you can teach non divers to become PADI Open Water Divers as well all certain specialties and other courses. As a PADI Divemaster or Instructor you will be a sought after asset to any dive centre around the world. Are you ready to join the ranks of the dedicated professionals who teach the world’s most progressive and popular scuba diver education programs? Then Go PRO with PADI and Poseidon Dive Centre. If you would like more time underwater and less time in the classroom then look no further! PADI’s eLearning gives you a flexible way to fit a scuba certification into your busy schedule. It allows you to do all the theory work in the comfort of your own home and test yourself using quiz questions. As you will be completing the online course through Poseidon Divers, we are at your disposal, so feel free to contact us at anytime with questions or concerns. As you will have online access to the course material for one year you will save money by not buying manuals and lighter holiday luggage! Once you have completed this work, you can come out to us and, after a short knowledge refresh, we jump straight into the water and on with the practical part of your course. This means maximum water time on your valuable holiday. The two required topics; Deep and Underwater Navigation Adventure Dives, are available as elearning topics along with five of the most popular elective dives. These include Night Diver, Peak Performance Buoyancy, Wreck Diver, Boat Diver and Underwater Naturalist. As with the PADI Open Water Diver course, the entire PADI Adventures in Diving manual (complete with all Adventure Dive possibilities) will be available online to divers enrolled in the course. Please note that if you wish to complete the PADI Enriched Air Diver (nitrox) or Digital Underwater Photographer Adventure Dives then the relationship to the Adventures in Diving program differs slightly. You will need to complete the knowledge development for those two programs separately, either through the PADI Enriched Air Online or Digital Underwater Photography Online programs or by purchasing the student manuals. Complete the Open Water Online through PADI E-Learning and spend more time diving on your holiday! Click on the link to find the online course. The Open Water Course has 5 theory sessions including 5 videos, 4 quizzes and one final exam. You will be able to complete all 5 sessions at your leisure whether in the evenings or even during your lunch break! Once you have completed the course online you will get an eLearning completion form that you will need to bring with you to complete your course. This means more time diving and less time studying so you can really enjoy your holiday! Find out more or book online here..
PADI Touch allows you to add courses to your PADI library on your smart phone or tablet device. Once installed the Touch course enables you to read the manual interactively, complete the knowledge reviews for each section online and then take the final exam online too. This means you can study on the move all prior to arriving at Poseidon Dive Centre. Once you are here there is a quick review to complete and then it’s straight into the water. This means you have more time to enjoy your holiday and also your studying is completely flexible. Install the library today from the App store or the play store and see the demo for Touch. PADI eLearning Gift Passes are as good as cash for any of PADI’s online courses. Purchase eLearning Gift Passes as a gift for family and friends today. If you would like more time underwater and less time in the classroom then look no further! PADI’s eLearning gives you a flexible way to fit a scuba certification into your busy schedule. It allows you to do all the theory work in the comfort of your own home and test yourself using quiz questions. Gauge your progress, review your learning history and access your knowledge before and after training. As you will be completing the online course through Poseidon Divers, we are at your disposal, so feel free to contact us at anytime with questions or concerns. PADI Touch allows you to add courses to your PADI library on your smart phone or tablet device. Once installed the Touch course enables you to read the manual interactively, complete the knowledge reviews for each section online and then take the final exam online too. This means you can study on the move all prior to arriving at Poseidon Dive Centre. Once you are here, there is a quick review to complete and then it’s straight into the water. This means you have more time to enjoy your holiday and also your studying is completely flexible. Install the library today from the App store or the play store and see the demo for Touch.